1947 detached house, cavity wall brick, with 1984 extension. This is a good example of Solar Thermal where you can get in and see all the ‘gubbins’ associated. 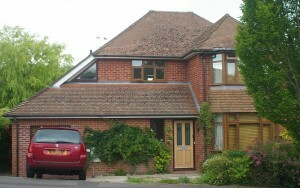 House refurbished in 2009 after purchase, before new owner moved in; this made major works possible (not practicable once occupied), including relocation of gas boiler, plus replacement of all radiators and central heating pipework due to limescale, plus relocation of most radiators from external to internal walls. Comment: This is a warm house, apart from some draughts from a few windows and back door which need draught proofing (will use Mr Cosy EPDM Rubber Strip Long Life Draught Excluder). New Wall Hung Gas-Fired Condensing System Boiler – Worcester Bosch Greenstar 12i/24i System. Relocated 2009 in 1st floor ‘Controls Room’. Sealed central heating system & indirect fed hot water. Comment: Very easy to use and no problems so far (after one initial installation problem with a bit of soldering) which S J King fixed very quickly. Two on west south west facing roof (at side of house) + Twin Coil Indirect Unvented Solar Water Cylinder – integral part of Worcester Bosch Greenskies system, i.e. all electronics compatible with Gas-Fired Condensing Boiler. Includes Solar System Controller which shows 2 temperatures: on the solar panels on roof, and in lower part of hot water cylinder. Thermostat set at max 60ºC. Comment: There is no way of comparing before and after for the effects of the new gas boiler and the solar panels on gas consumption because new owner did not live in house before their installation in May/June 2009. However, during July/August/1-15September 2009 hot water was heated only by the solar panels; consumption related only to gas used for cooking. Solar panels are heated even when the sun is not shining but the air temperature is high enough. Installed by S.J.King heating & Plumbing Ltd, Winchester (tel 01962 882 782). installed in ground floor ensuite and upstairs bathroom. All windows and external doors are double glazed. Both front and back doors (partially glazed) replaced in 2009. Various double glazed windows installed by previous owner at unknown dates. Some windows have failed and been replaced in 2009. Landing and two bay windows replaced 2010. Some old double glazing very difficult to take out of 1984 extension window frames, e.g. ground floor bedroom fanlight window frame was therefore replaced as well. Hunter Multifuel Stove – Hawk 4D 3.5 – 5KW (flat top) installed in garden room May 2009. Chimney relined with 6″ class 1 stainless steel flexible liner. Comment: Lucky to obtain a stove from stock on the premises at King’s Worthy; there can be a delay in delivery of several months at certain times of year. Bryan Frost Chimneys were most helpful with installing the stove at short notice to fit in with the decoration schedule. The stove heats the garden room and kitchen very quickly; used it more in the autumn than during this very cold winter when had central heating on for longer when people are in the house. Various types of compact fluorescent (CFL) light bulbs used throughout, mostly Philips Genie & Tornado. External Lighting: a variety of CFL & other light bulbs, most on sensors: front door, side path to back door, rear of house. Comment: Find Philips bulbs more reliable and give better quality of warm light than other makes, though still have to pick and choose which come on fastest: i.e uneven performance between individual bulbs of same make. The Building Inspector approved work done in ground floor bedroom and ensuite (new drains etc) insisted on energy efficient light fitting in that area: installed in lobby between bedroom & hall. Have not fitted alternative bulb which is slowest to come on in whole house. New Front Door made of European White Oak designed to meet current Government regulations for energy efficiency (Part L). U value 1.89. Comment: The door is delivered still requiring a final coat of varnish. Ideally it should be positioned so that it does not receive the direct battering of rain on the wood, i.e. there needs to be a porch to protect it.